For a person to be happy, it is not important that you constantly run behind happiness like a fool. The amount of sadness and happiness is well balanced in this universe, so you should go according to it. In the path of happiness, destination matters but the amount of happiness is very important. It will encourage you to keep going no matter what the situation is and represents a shine on your face. Happiness is not a race where you run behind it and there is no competition for happiness as all are served equally with the ability to love others and spread it all over the world. Be it any work, if you do it with happiness, however difficult the work may be, it will contain all the fun, as you are happy. If you take your work as a burden and then look for happiness, all you will end up finding is stress, anxiety. Further you have left all the hopes of finding the inner happiness. 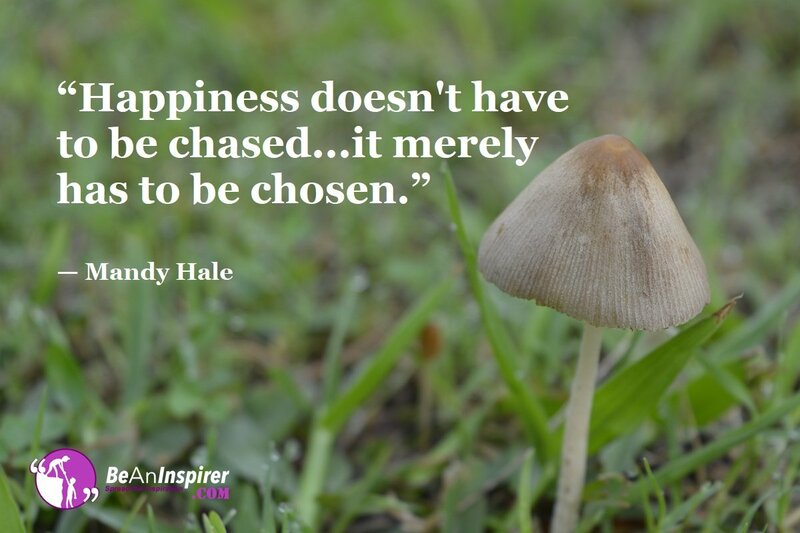 So never chase happiness for a reason. It will come looking for you when you really deserve it. If you chase it, then it will never come in your hands and you shall lead to depression. In any work you do, happiness hides inside. You just have to bring it outside so that you love your job without any kind of stress. Suppose, if a man opens his own company of manufacturing pens, he will invest a lot of money and time on it where he has a fear of failing in every step of success. He can handle this in two situations – first, he can think again and again about work whether employees will work properly or not and whether people are going to like these pens or not. He forgets that success and happiness is not a race where you will achieve it all of a sudden, in fact, it has to be dealt within. Another way is that he can take this job in a very fun manner and think about all the best possible outcomes in advance so that if there is any kind of disadvantage, he shall have the solution ready to face the problem. Therefore, if you look carefully, it is not necessary to take tension and be stressed out but let your job contain all the fun and activities that happiness will find you in no time. At the end of the day what matters is the path of happiness, which is chosen to walk on for achieving your end goal in life. Make sure that you do not waste your precious and valuable time in finding happiness. It is present everywhere and it is not necessary that it should be found at certain places only. In life, however, destination matters but the path of happiness must always be followed. In simple words, happiness is not a race but it is the way in which you meet the happiness in every part of your life. While going on this path, many obstacles will be faced by you but if you smilingly, being positive and take it in all fun way, you would never be left behind. You choose to be happy. Happiness does not come to anybody itself. We hope we were able to make you understand it clearly and that you would try to follow it in your lives as well. Do comment your thoughts on the article and let us know which path you have chosen in your lives.